5. LE Note 2, p. 56: [The text of the aphorism, in black-letter in the 1880 edition, is from “To speak and act truth . . .” down to the end of § 1. 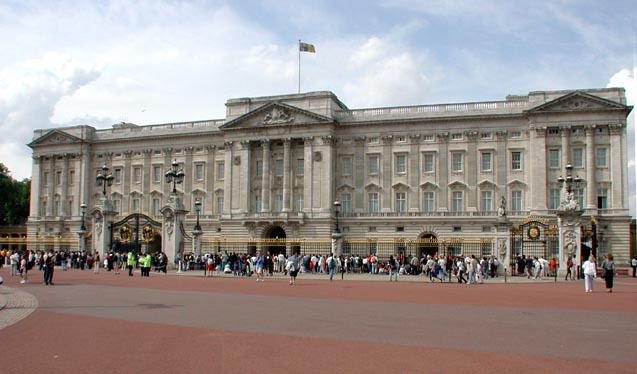 Special reference was perhaps intended to the Italian frontage added to Buckingham 1846 by Blore. 16. LE note 2, p. 61: [See, e.g., § 21 below, for the speculation which connected tracery with trees.] 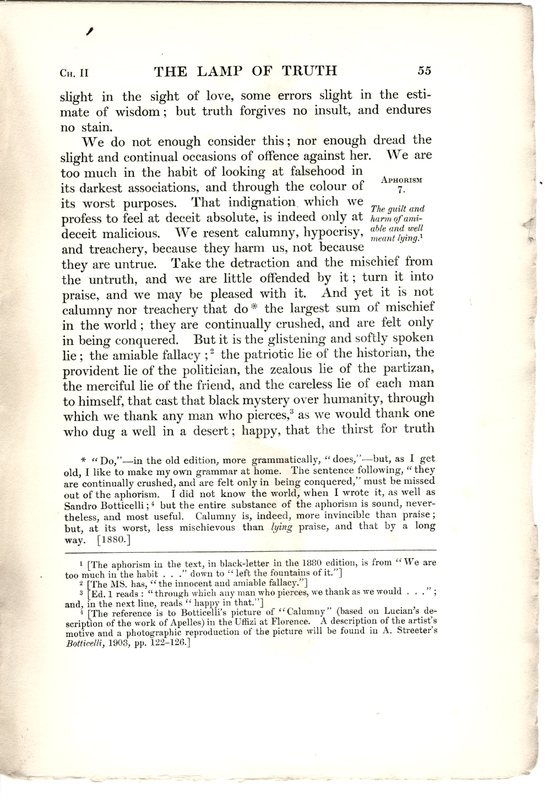 Although the footnote number is missing from the text, the subject of the note itself suggests LE intended it to annotate “stems and branches.” — GPL. [Ed note: "Mr. Hope wisely reprehends, for this reason, the arrangement of the main piers of St. Sophia at Constantinople. King's College Chapel, Cambridge, is a piece of architectural juggling, if possible still more to be condemned, because less sublime." 22*. They are noticed by Mr. Whewell as forming the figure of the fleur-de-lys, always a mark, when in tracery bars, of the most debased flamboyant. It occurs in the central tower of Bayeux, very richly in the buttresses of St. Gervais at Falaise, and in the small niches of some of the domestic buildings at Rouen. Nor is it only the tower of St. Ouen which is overrated. Its nave is a base imitation, in the flamboyant period, of an early Gothic arrangement; the niches on its piers are barbarisms; there is a huge square shaft run through the ceiling of the aisles to support the nave piers, the ugliest excrescence I ever saw on a Gothic building; the traceries of the nave are the most insipid and faded flamboyant; those of the transept clerestory present a singularly distorted condition of perpendicular; even the elaborate door of the south transept is, for its fine period, extravagant and almost grotesque in its foliation and pendants. There is nothing truly fine in the church but the choir, the light triforium, and tall clerestory, the circle of Eastern chapels, the details of sculpture, and the general lightness of proportion; these merits being seen to the utmost advantage by the freedom of the body of the church from all incumbrance. 27. LE note 2, p. 67: [Brunelleschi's account of the place of iron in his scheme for the cupola may be read in Vasari, vol. i. pp. 432-483 (Bohn's ed. 1855).] 28*. JR note, p 67: “This way of tying walls together with iron, instead of making them of that substance and form, that they shall naturally poise themselves upon theirbuttment, is against the rules of good architecture, not only because iron is corruptible by rust, but because it is fallacious, having unequal veins in the metal, some places of the same bar being three times stronger than others, and yet all sound to appearance.” (Survey of Salisbury Cathedral in 1668, by Sir C. Wren.) 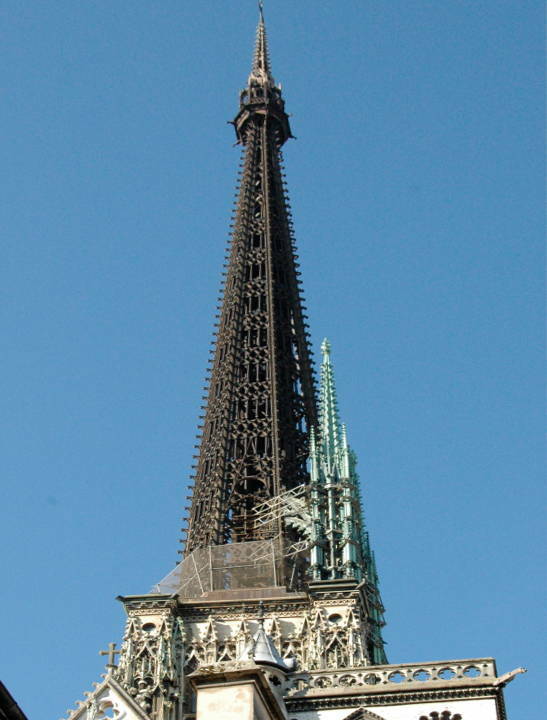 For my own part, I think it better work to bind a tower with iron, than to support a false dome by a brick pyramid. The editors of LE add "As in the case in St. Paul's: see Pugin's True Principles of Christian Architecture, 1853, p. 8. The above was Note 8 at the end of eds. 1 and 2, omitted in the 1880 and later editions. The editors of LE add [The 1880 edition here added, "See Appendix III.," the reference being to the author's note now given on p. 67, above. The definition of iron by the Delphic oracle is given in Herodotus (i. G8): [Greek quotation]. §1. THERE is a marked likeness between the virtue of man and the enlightenment of the globe he inhabits the same diminishing gradation in vigour up to the limits of their domains, the same essential separation from their contraries the same twilight at the meeting of the two: a something wider belt than the line where the world rolls into night, that strange twilight of the virtues; that dusky debateable land, wherein zeal becomes impatience, and temperance becomes severity, and justice becomes cruelty, and faith superstition, and each and all vanish into gloom. Nevertheless, with the greater number of them, though their dimness increases gradually, we may mark the moment of their sunset; and, happily, may turn the shadow back by the way by which it had gone down: but for one, the line of the horizon is irregular and undefined; and this, too, the very equator and girdle of them all Truth; that only one of which there are no degrees, but breaks and rents continually; that pillar of the earth, yet a cloudy pillar; that golden and narrow line, which the very powers and virtues that lean upon it bend, which policy and prudence conceal, which kindness and courtesy modify, which courage overshadows with his shield, imagination covers with her wings, and charity dims with her tears. How difficult must the maintenance of that authority be, which, while it has to restrain the hostility of all the worst principles of man, has also to restrain the disorders of his best which is continually assaulted by the one and betrayed by the other, and which regards with the same severity the lightest and the boldest violations of its law! There are some faults [54/55] slight in the sight of love, some errors slight in the estimate of wisdom; but truth forgives no insult, and endures no stain. We do not enough consider this; nor enough dread the slight and continual occasions of offence against her. We are too much in the habit of looking at falsehood in its darkest associations, and through the color of its worst purposes. That indignation which we profess to feel at deceit absolute, is indeed only at deceit malicious. We resent calumny, hypocrisy and treachery, because they harm us, not because they are untrue. Take the detraction and the mischief from the un truth, and we are little offended by it; turn it into praise, and we may be pleased with it. And yet it is not calumny nor treachery that do2* the largest sum of mischief in the world; they are continually crushed, and are felt only in being con quered. But it is the glistening and softly spoken lie; the amiable fallacy;3 the patriotic lie of the historian, the provident lie of the politician, the zealous lie of the partizan, the merciful lie of the friend, and the careless lie of each man to him self, that cast that black mystery over humanity, through which any man who pierces, we thank as we would thank one who dug a well in a desert; happy in that the thirst for truth [55/56] still remains with us, even when we have wilfully left the fountains of it. It would be well if moralists less frequently confused the greatness of a sin with its unpardonableness. The two characters are altogether distinct. The greatness of a fault depends partly on the nature of the person against whom it is committed, partly upon the extent of its consequences. Its pardonableness depends, humanly speaking, on the degree of temptation to it. One class of circumstances determines the weight of the attaching punishment; the other, the claim to remission of punishment: and since it is not always easy for men to estimate the relative weight, nor always possible for them to know the relative consequences, of crime, it is usually wise in them to quit the care of such nice measurements, and to look to the other and clearer condition of culpability, esteeming those faults worst which are committed under least temptation. I do not mean to diminish the blame of the injurious and malicious sin, of the selfish and deliberate falsity; yet it seems to me, that the shortest way to check the darker forms of deceit is to set watch more scrupulous against those which have mingled, unregarded and unchastised, with the current of our life. Do not let us lie at all. Do not think of one falsity as harmless, and another as slight, and another as unintended. Cast them all aside: they may be light and accidental; but they are an ugly soot from the smoke of the pit,4 for all that; and it is better that our hearts should be swept clean of them, without over care as to which is largest or blackest. § 5. The violations of truth, which dishonour poetry and painting, are thus for the most part confined to the treatment of their subjects. But in architecture another and a less subtle, more contemptible, violation of truth is possible; a direct falsity of assertion respecting the nature of material, or the quantity of labour. And this is, in the full sense of the word, wrong; it is as truly deserving of reprobation as any other moral delinquency; it is unworthy alike of architects and of nations; and it has been a sign, wherever it has widely and with toleration existed, of a singular debasement of the arts; that it is not a sign of worse than this, of a general want of severe probity, can be accounted for only by our knowledge of the strange separation which has for some centuries existed between the arts and all other subjects of human intellect, as matters of conscience. This withdrawal of conscientiousness from among the faculties concerned with art, while it has destroyed the arts themselves, has also rendered in a measure nugatory the evidence which otherwise they might have presented respecting the character of the respective nations among whom they have [59/60] been cultivated; otherwise, it might appear more than strange that a nation so distinguished for its general uprightness and faith as the English, should admit in their architecture more of pretence, concealment, and deceit, than any other of this or of past time. They are admitted in thoughtlessness, but with fatal effect upon the art in which they are practised. If there were no other causes for the failures which of late have marked every great occasion for architectural exertion, these petty dishonesties would be enough to account for all.12 It is the first step, and not the least, towards greatness, to do away with these; the first, because so evidently and easily in our power. We may not be able to command good, or beautiful, or inventive, architecture; but we can command an honest architecture: the meagreness of poverty may be pardoned, the sternness of utility respected; but what is there but scorn for the meanness of deception? 1st. The suggestion of a mode of stnicture or support, other than the true one; as in pendants of late Gothic roofs. 2d. The painting of surfaces to represent some other material than that of which they actually consist (as in the marbling of wood13), or the deceptive representation of sculptured ornament upon them. 3d. The use of cast or machine-made ornaments of any kind. Now, it may be broadly stated, that architecture will be noble exactly in the degree in which all these false expedients are avoided. Nevertheless, there are certain degrees of them, which, owing to their frequent usage, or to other causes, have so far lost the nature of deceit as to be admissible; as, for [60/61] instance, gilding, which is in architecture no deceit, because it is therein not understood for gold; while in jewellery it is a deceit, because it is so understood, and therefore altogether to be reprehended. So that there arise, in the application of the strict rules of right, many exceptions and niceties of conscience; which let us as briefly as possible examine. There is, however, a certain deception necessarily occurring in Gothic architecture, which relates, not to the points, but to the manner, of support. The resemblance in its shafts and ribs to the external relations of stems and branches, which has been the ground of so much foolish speculation, necessarily induces in the mind of the spectator a sense or [61/62] belief of a correspondent internal structure; that is to say, of a fibrous and continuous strength from the root into the limbs, and an elasticity communicated upwards, sufficient for the support of the ramified portions. 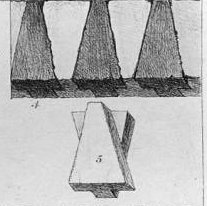 The idea of the real conditions, of a great weight of ceiling thrown upon certain narrow, jointed lines, which have a tendency partly to be crushed, and partly to separate and be pushed outwards, is with difficulty received; and the more so when the pillars would be, if unassisted, too slight for the weight, and are supported by external flying buttresses, as in the apse of Beauvais, and other such achievements of the bolder Gothic. Now, there is a nice question of conscience in this, which we shall hardly settle but by considering that, when the mind is informed beyond the possibility of mistake as to the true nature of things, the affecting it with a contrary impression, however distinct, is no dishonesty, but, on the contrary, a legitimate appeal to the imagination.17 For instance, the greater part of the happiness which we have in contemplating clouds, results from the impression of their having massive, luminous, warm, and mountain-like surfaces; and our delight in the sky frequently depends upon our considering it as a blue vault. But, if we choose, we may know the contrary, in both instances; and easily ascertain18 the cloud to be a damp fog, or a drift of snow-flakes; and the sky to be a lightless abyss. There is, therefore, no dishonesty, while there is much delight, in the irresistibly contrary impression. In the same way, so long as we see the stones and joints, and are not deceived as to the points of support in any piece of architecture, we may rather praise than regret the dexterous artifices which compel us to feel as if there were fibre in its shafts and life in its branches. Nor is even the concealment of the support of the external buttress reprehensible, so long as the pillars are not sensibly inadequate to their duty. For the weight of a roof is a [62/63] circumstance of which the spectator generally has no idea, and the provisions for it, consequently, circumstances whose necessity or adaptation he could not understand. It is no deceit, therefore, when the weight to be borne is necessarily unknown, to conceal also the means of bearing it, leaving only to be perceived so much of the support as is indeed adequate to the weight supposed. For the shafts do, indeed, bear as much as they are ever imagined to bear, and the system of added support is no more, as a matter of conscience, to be exhibited, than, in the human or any other form, mechanical provisions for those functions which are themselves unperceived. § 8. With deceptive concealments of structure are to be classed, though still more blameable, deceptive assumptions of it, the introduction of members which should have, or profess [63/64] to have, a duty, and have none.20 One of the most general instances of this will be found in the form of the flying buttress in late Gothic. 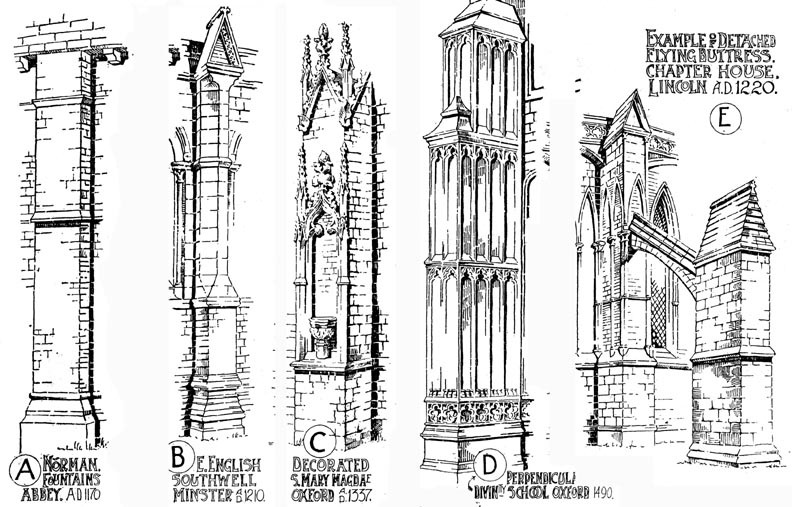 The use of that member is, of course, to convey support from one pier to another when the plan of the building renders it necessary or desirable that the supporting masses should be divided into groups; the most frequent necessity of this kind arising from the intermediate range of chapels or aisles between the nave or choir walls and their supporting piers. Fletcher's A History of Architecture on the Comparative Method (1905). § 9.Perhaps the most fruitful sources of these kinds of corruption which we have to guard against in recent times, is one which, nevertheless, comes in a “questionable shape,”24 and of which it is not easy to determine the proper laws and limits; I mean the use of iron. The definition of the art of architecture, given in the first Chapter, is independent of its materials. Nevertheless, that art having been, up to the beginning of the present century, practised for the most part in clay, stone, or wood, it has resulted that the sense of proportion and the laws of structure have been based, the one altogether, the other in great part, on the necessities consequent on the employment of those materials; and that the entire or principal employment of metallic framework would, therefore, be generally felt as a departure from the first principles of the art. Abstractedly there appears no reason why iron should not be used as well as wood; and the time is probably near when a new system of architectural laws will be developed, adapted entirely to metallic construction. But I believe that the tendency of all present25* sympathy and association is to limit the idea of architecture to non-metallic work; and that not without reason. For architecture being in its perfection the earliest, as in its elements it is necessarily the first, of arts, will always precede, in any barbarous nation, the possession of the science necessary either for the obtaining or the management of iron. Its first existence and its earliest laws must, therefore, depend upon the use of materials accessible in quantity, and on the surface of the earth; that is to [66/67] say, clay, wood, or stone: and as I think it cannot but be generally felt that one of the chief dignities of architecture is its historical use, and since the latter is partly dependent on consistency of style, it will be felt right to retain as far as may be, even in periods of more advanced science, the materials and principles of earlier ages. 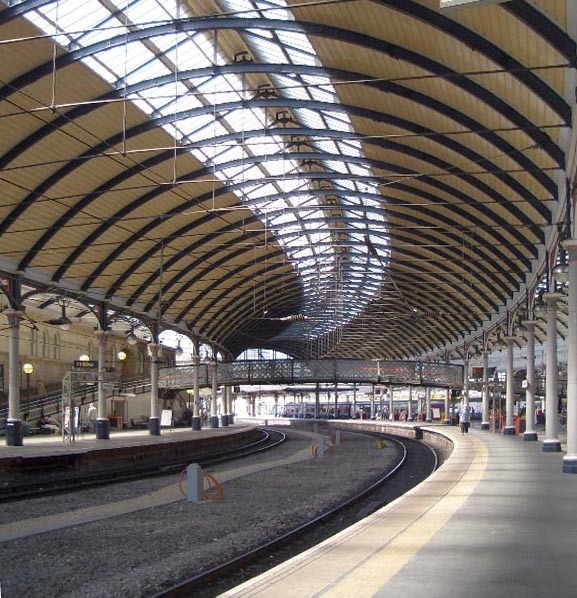 Station (1847-50), Newcastle — the first covered station in the world. § 10. But whether this be granted me or not, the fact is, that every idea respecting size, proportion, decoration, or construction, on which we are at present in the habit of acting or judging, depends on presupposition of such materials: and as I both feel myself unable to escape the influence of these prejudices, and believe that my readers will be equally so, it may be perhaps permitted to me to assume that true architecture does not admit iron as a constructive material,26* and that such works as the cast-iron central spire of Rouen Cathedral, or the iron roofs and pillars of our railway stations, and of some of our churches, are not architecture at all. Yet it is evident that metals may, and sometimes must, enter into the construction to a certain extent, as nails in wooden architecture, and therefore, as legitimately, rivets and solderings in stone; neither can we well deny to the Gothic architect the power of supporting statues, pinnacles, or traceries by iron bars; and if we grant this, I do not see how we can help allowing Brunelleschi his iron chain around the dome of Florence,27 or the builders of Salisbury28* their elaborate iron binding of the central tower. If, however, we would not fall [67/68] into the old sophistry of the grains of corn and the heap, we must find a rule which may enable us to stop somewhere. Nevertheless, where the design is of such delicacy and slightness as, in some parts of very fair and finished edifices, it is desirable that it should be; and where both its completion and security are in a measure dependent on the use of metal, let not such use be reprehended; so only that as much is done as may be, by good mortar and good masonry; and no slovenly workmanship admitted through confidence in the iron helps; for it is in this license as in that of wine, a man may use it for his infirmities, but not for his nourishment. § 12. 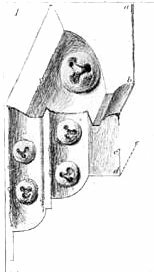 And, in order to avoid an over use of this liberty, it would be well to consider what application may be conveniently made of the dovetailing and various adjusting of stones; for when any artifice is necessary to help the mortar, certainly this ought to come before the use of metal, for it is both safer and more honest. I cannot see that any objection can be made to the fitting of the stones in any shapes the architect pleases; for although it would not be desirable to see buildings put together like Chinese puzzles, there must always be a check upon such an abuse of the practice in its difficulty; nor is it necessary that it should be always exhibited, so that it be understood by the spectator as an admitted help, and that no principal stones are introduced in positions apparently impossible for them to retain, although a riddle here and there, in unimportant features, may sometimes serve to draw the eye to the masonry, and make it interesting, as well as to give a delightful sense of a kind of necromantic power in the architect. 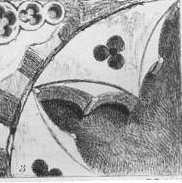 There is a pretty one in the lintel of the lateral door of the cathedral of Prato34 (Plate IV. fig. 4); where the maintenance of the visibly separate stones, alternate marble and serpentine, cannot be [70/71] understood until their cross-cutting is seen below. Each block is, of course, of the form given in fig. 5. § 14. 2d. Surface Deceits. These may be generally defined as the inducing the supposition of some form or material which does not actually exist; as commonly in the painting of wood to represent marble,41 or in the painting of ornaments in deceptive relief,42 &c. But we must be careful to observe, that the evil of them consists always in definitely attempted deception and that it is a matter of some nicety to mark the point where deception begins or ends. The roof of the Sistine Chapel has much architectural design in grissaille mingled with the figures of its frescoes; and the effect is increase of dignity. In what lies the distinctive character? In two points, principally: — First. That the architecture is so closely associated with the figures, and has so grand fellow ship with them in its forms and cast shadows, that both are at once felt to be of a piece; and as the figures must necessarily be painted, the architecture is known to be so too. There is thus no deception. The second, that so great a painter as Michael Angelo would always stop short in such minor parts of his design, of the degree of vulgar force which would be necessaiy to induce the supposition of their reality; and, strangely as it may sound, would never paint badly enough to deceive. But though right and wrong are thus found broadly opposed in works severally so mean and so mighty as the roof of Milan and that of the Sistine, there are works neither so greeat nor so mean, in which the limits of right are vaguely defined, and will need some care to determine; care only, however, to apply accurately the broad principle with which we set out, that no form nor material is to be deceptively represented. In the cupola of the duomo of Parma the same painter has represented the Assumption with so much deceptive power, that he has made a dome of some thirty feet diameter look like a cloud-wrapt opening in the seventh heaven, crowded with a rushing sea of angels.50 Is this wrong? Not so: for the subject at once precludes the possibility of deception. We might have taken the vines for a veritable pergola, and the children for its haunting ragazzi; but we know the stayed cloud and moveless angels must be man's work; let him put his utmost strength to it, and welcome; he can enchant us, but cannot betray. We may thus apply the rule to the highest, as well as the art of daily occurrence, always remembering that more is to be forgiven to the great painter than to the mere decorative workman; and this especially, because the former, even in deceptive portions, will not trick us so grossly; as we have just seen in Correggio, where a worse painter would have made the thing look like life at once. There is, however, in room, villa, or garden decoration, some fitting admission of trickeries of this kind, as of pictured landscapes at the extremities of alleys and arcades, and ceilings like skies, or painted with prolongations upwards of the architecture of the walls, which things have sometimes a certain luxury and pleasureableness in places meant for idleness, and are51 innocent enough as long as they are regarded as mere toys. 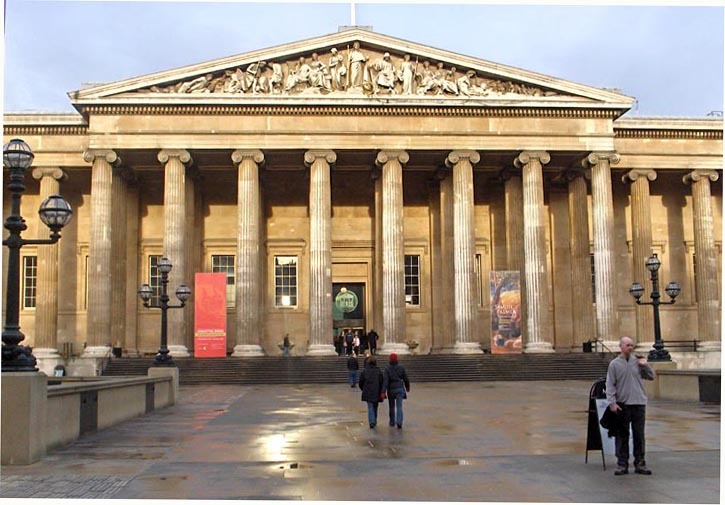 The British Museum, by Sir Robert Smirke. 1823-47.
to express also my regret that the noble granite foundation of the staircase should be mocked at its landing by an imitation, the more blameable because tolerably successful.53 The only effect of it is to cast a suspicion upon the true stones below, and upon every bit of granite afterwards encountered. One feels a doubt, after it, of the honesty of Memnon54 himself. But even this, however derogatory to the noble architecture around it, is less painful than the want of feeling with which, in our cheap modern churches, we suffer the wall decorator to erect about the altar frameworks55 and pediments daubed with mottled colour, and to dye in the same fashion such skeletons or caricatures of columns as may emerge above the pews: this is not merely bad taste; it is no unimportant or excusable error which brings even these shadows of vanity and falsehood into the house of prayer. The first condition which just feeling requires in church furniture is, that it should be simple and unaffected, not fictitious nor tawdry. It may not be in our [76/77] power to make it beautiful, but let it at least be pure; and if we cannot permit much to the architect, do not let us permit anything to the upholsterer; if we keep to solid stone and solid wood, whitewashed, if we like, for cleanliness' sake, (for whitewash has so often been used as the dress of noble things that it has thence received a kind of nobility itself,) it must be a bad design indeed, which is grossly offensive. I recollect no instance of a want of sacred character, or of any marked and painful ugliness, in the simplest or the most awkwardly built village church, where stone and wood were roughly and nakedly used, and the windows latticed with white glass. But the smoothly stuccoed walls, the flat roofs with ventilator ornaments, the barred windows with jaundiced borders and dead ground square panes, the gilded or bronzed wood, the painted iron, the wretched upholstery of curtains and cushions, and pew heads, and altar railings, and Birmingham metal candlesticks, and, above all, the green and yellow sickness of the false marble disguises all, observe; falsehoods all who are they who like these things? who defend them? who do them? I have never spoken to any one who did like them, though to many who thought them matters of no consequence. Perhaps not to religion; (though I cannot but believe that there are many to whom, as to myself, such things are serious obstacles to the repose of mind and temper which should precede devotional exercises;) but to the general tone of our judgment and feeling yes; for assuredly we shall regard, with tolerance, if not with affection, whatever forms of material things we have been in the habit of associating with our worship, and be little prepared to detect or blame hypocrisy, meanness, and disguise in other kinds of decoration, when we suffer objects belonging to the most solemn of all services to be tricked out in a fashion so fictitious and unseemly. § 17. Painting, however, is not the only mode in which material may be concealed, or rather simulated; for merely to conceal is, as we have seen, no wrong. Whitewash, for instance, though often (by no means always) to be regretted as a concealment, is not to be blamed as a falsity. It shows itself [77/78] for what it is, and asserts nothing of what is beneath it. Gilding has become, from its frequent use, equally innocent. It is understood for what it is, a film merely, and is, therefore, allowable to any extent: I do not say expedient: it is one of the most abused means of magnificence we possess, and I much doubt whether any use we ever make of it, balances that loss of pleasure, which, from the frequent sight and perpetual suspicion of it, we suffer in the contemplation of any thing that is verily of gold. I think gold was meant to be seldom seen, and to be admired as a precious thing; and I sometimes wish that truth should so far literally prevail as that all should be gold that glittered, or rather that nothing should glitter that was not gold. Nevertheless, Nature herself does not dispense with such semblance, but uses light for it; and I have too great a love for old and saintly art to part with its burnished field, or radiant nimbus; only it should be used with respect, and to express magnificence, or sacredness, and not in lavish vanity, or in sign painting. Of its expedience, however, any more than that of colour, it is not here the place to speak; we are endeavouring to determine what is lawful, not what is desirable. Of other and less common modes of disguising surface, as of powder of lapis lazuli, or mosaic imitations of coloured stones, I need hardly speak. The rule will apply to all alike, that whatever is pretended, is wrong; commonly enforced also by the exceeding ugliness and insufficient appearance of such methods, as lately in the style of renovation by which half the houses in Venice have been defaced, the brick covered first with stucco, and this painted with zigzag veins in imitation of alabaster.56 But there is one more form of architectural fiction, which is so constant in the great periods that it needs respectful judgment. I mean the facing of brick with precious stone. § 18. It is well known, that what is meant by a church's being built of marble is, in nearly all cases, only that a veneering of marble has been fastened on the rough brick wall, built [78/79] with certain projections to receive it; and that what appear to be massy stones, are nothing more than external slabs. Now, it is evident, that, in this case, the question of right is on the same ground as in that of gilding. If it be clearly understood that a marble facing "stones of does not pretend or imply a marble wail, there is facing brick no harm in it; and as it is also evident that, with marble is when very precious stones are used, as jaspers form of Mosaic, and serpentines, it must become, not only an extravagant and vain increase of expense, but sometimes an actual impossibility, to obtain mass of them enough to build with, there is no resource but this of veneering; nor is there anything to be alleged against it on the head of durability, such work having been by experience found to last as long, and in as perfect condition, as any kind of masonry. It is, therefore, to be considered as simply an art of mosaic on a large scale, the ground being of brick, or any other material; and when lovely stones are to be obtained, it is a manner which should be thoroughly understood, and often practised. Nevertheless, as we esteem the shaft of a column more highly for its being of a single block, and as we do not regret the loss of substance and value which there is in things of solid gold, silver, agate, or ivory; so I think that walls themselves may be regarded with a more just complacency if they are known to be all of noble substance; and that rightly weighing the demands of the two principles of which we have hitherto spoken Sacrifice and Truth, we should sometimes rather spare external ornament than diminish the unseen value and consistency of what we do; and I believe that a better manner of design, and a more careful and studious, if less abundant, decoration would follow, upon the consciousness of thoroughness in the substance. And, indeed, this is to be remembered, with respect [79/80] to all the points we have examined; that while we have traced the limits of license, we have not fixed those of that high rectitude which refuses license. It is thus true that there is no falsity, and much beauty, in the use of external colour, and that it is lawful to paint either pictures or patterns on whatever surfaces may seem to need enrichment. But it is not less true, that such practices are essentially unarchitectural; and while we cannot say that there is actual danger in an over use of them, seeing that they have been always used most lavishly in the times of most noble art, yet they divide the work into two parts and kinds, one of less durability than the other, which dies away from it in process of ages, and leaves it, unless it have noble qualities of its own, naked and bare. That enduring noblesse I should, therefore, call truly architectural; and it is not until this has been secured, that the accessory power of painting may be called in, for the delight of the immediate time; nor this, as I think, until every resource of a more stable kind has been exhausted. The true colours of architecture are those of natural stone, and I would fain see these taken The proper advantage of to the full. Every variety of hue, from pale yellow to purple, passing through orange, red, and brown, is entirely at our command; nearly every kind of green and gret us aksi attainable; and with these, and pure white, what harmonies might we not achieve? Of stained and variegated stone, the quantity is unlimited, the kinds innumerable; where brighter colours are required, let glass, and gold protected by glass, be used in mosaic a kind of work as durable as the solid stone, and incapable of losing its lustre by time and let the painter's work be reserved for the shadowed loggia and inner chamber. This is the true and faithful way of building; where this cannot be, the device of external colouring may, indeed, be employed without dishonour; but it must be with the warning reflection, that a time will come when such aids must pass away, [80/81] and when the building will be judged in its lifelessness, dying the death of the dolphin. Better the less bright,60 more enduring fabric. The transparent alabasters of San Miniato, and the mosaics of St. Mark's, are more warmly filled, and more brightly touched, by every return of morning and evening rays; while the hues of our cathedrals have died like the iris out of the cloud; and the temples whose azure and purple once flamed above the Grecian promontories, stand in their faded whiteness, like snows which the sunset has left cold. § 19. The last form of fallacy which it will be remembered we had to deprecate, was the substitution of cast or machine work for that of the hand, generally expressible as Operative Deceit. There are two reasons, both weighty, against this practice; one, that all cast and machine work is bad, as work; the other, that it is dishonest. Of its badness, I shall speak in another place,61 that being evidently no efficient reason against its use when other cannot be had. Its dishonesty, however, which, to my mind, is of the grossest kind, is, I think, a sufficient reason to determine absolute and unconditional rejection of it. Ornament, as I have often before observed, has two entirely distinct sources of agreeableness: one, that of the abstract beauty of its forms, which, for the present, we will suppose to be the same whether they come from the hand or the machine; the other, the sense of human labour and care spent upon it. How great this latter influence we may perhaps judge, by considering that there is not a cluster of weeds growing in any cranny of ruin62* which has not a [81/82] beauty in all respects nearly equal, and, in some, immeasurably superior, to that of the most elaborate sculpture of its stones: and that all our interest in the carved work, our sense of its richness, though it is tenfold less rich than the knots of grass beside it; of its delicacy, though it is a thousandfold less delicate; of its admirableness, though a millionfold less admirable; results from our consciousness of its being the work of poor, clumsy, toilsome man. Its true delightfulness depends on our discovering in it the record of thoughts, and intents, and trials, and heartbreakings of recoveries and joyfulnesses of success: all this can be traced by a practised eye; but, granting it even obscure, it is presumed or understood; and in that is the worth63* of the thing, just as much as the worth of any thing else we call precious. The worth of a diamond is simply the understanding of the time it must take to look for it before it is found; and the worth of an ornament is the time it must take before it can be cut. It has an intrinsic value besides, which the diamond has not; (for a diamond has no more real beauty than a piece of glass;) but I do not speak of that at present; I place the two on the same ground; and I suppose that hand- wrought ornament can no more be generally known from machine work, than a diamond can be known from paste; nay, that the latter [82/83] may deceive, for a moment, the mason's, as the other the jeweller's, eye; and that it can be detected only by the closest examination. Yet exactly as a woman of feeling would not wear false jewels, so would a builder of honour disdain false ornaments. The using of them is just as downright and inexcusable a lie.64 You use that which pretends to a worth which it has not; which pretends to have cost, and to be, what it did not, and is not; it is an imposition, a vulgarity, an impertinence, and a sin. Down with it to the ground, grind it to powder, leave its ragged place upon the wall, rather; you have not paid for it, you have no business with it, you do not want it. Nobody wants ornaments in this world, but everybody wants integrity. All the fair devices that ever were fancied, are not worth a lie. Leave your walls as bare as a planed board, or build them of baked mud and chopped straw, if need be; but do not rough-cast them with falsehood. § 20. Thus in the use of brick: since that is known to be originally moulded, there is no reason why it should not be moulded into diverse forms. It will never be supposed to have been cut, and, therefore, will cause no deception; it will have only the credit it deserves. In flat countries, far from any quarry of stone, cast brick may be legitimately, and most successfully, used in decoration, and that elaborate, and even refined. The brick mouldings of the Palazzo Pepoli at Bologna, and those which run round the market-place of Vercelli, are among the richest in Italy.68 So also, tile and porcelain work, of which the former is grotesquely, but successfully, employed in the domestic architecture of France, coloured tiles being inserted in the diamond spaces between the crossing timbers; and the latter admirably in Tuscany, in external bas-reliefs, by the Robbia family, in which works, while we cannot but sometimes regret the useless and ill-arranged colours,69 we would by no means blame the employment of a material which, whatever its defects, excels every other in permanence, and, perhaps, requires even greater skill in its management than marble. For it is not the material, but the absence of the human labour, which makes the thing worthless; and a piece of terra cotta, or of plaster of Paris, which has been wrought by the human hand, is worth all the stone in Carrara, cut by machinery. It is, indeed, possible, and even usual, for men to sink into machines themselves, so that even hand-work has all the characters of mechanism; of the difference between living and dead hand-work I shall speak presently;70 all that I ask at present is, what it is always in our power to secure the confession of what we have done, and what we have given; so that when we use stone at [84/85] all,71* (since all stone is naturally supposed to be carved by hand,) we must not carve it by machinery; neither must we use any artificial stone cast into shape, nor any stucco ornaments of the colour of stone, or which might in any wise be mistaken for it, as the stucco mouldings in the cortile of the Palazzo Vecchio at Florence, which cast a shame and suspicion over every part of the building. But for ductile and fusible materials, as clay, iron, and bronze, since these will usually be supposed to have been cast or stamped, it is at our pleasure to employ them as we will; remembering that they become precious, or otherwise, just in proportion to the hand-work upon them, or to the clearness of their reception of the handwork of their mould. But72 I believe no cause to have been more active in the degradation of our national feeling for beauty than the constant use of cast-iron ornaments. 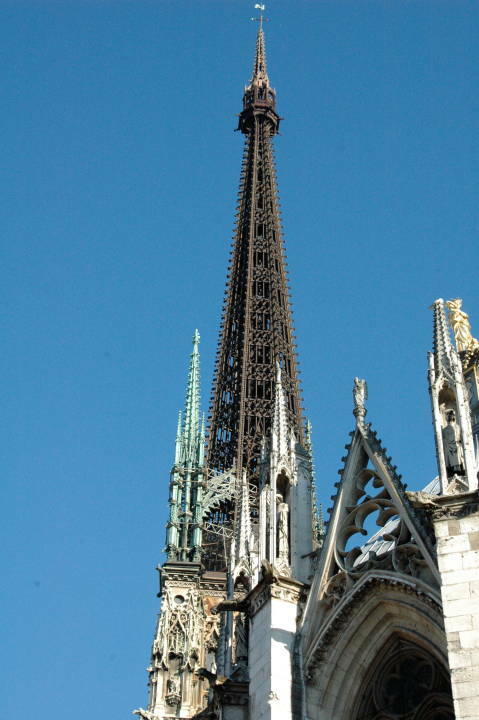 The common iron work of the middle ages was as simple as it was effective, ornamentation composed of leafage cut flat out of sheet iron, and twisted at the workman's will.74 No ornaments, on the [85/86] contrary, are so cold, clumsy, and vulgar, so essentially incapable of a fine line or shadow, as those of cast-iron; and while, on the score of truth, we can hardly allege anything against them, since they are always distinguishable, at a glance, from wrought and hammered work, and stand only for what they are, yet I feel very strongly that there is no hope of the progress of the arts of any nation which indulges in these vulgar and cheap substitutes for real decoration. Their inefficiency and paltriness I shall endeavour to show more conclusively in another place;75 enforcing only, at present, the general conclusion that, if even honest or allowable, they are things in which we can never take just pride or pleasure, and must never be employed in any place wherein they might either themselves obtain the credit of being other and better than they are, or be associated with the thoroughly downright work to which it would be a disgrace to be found in their company. § 22. Now, it will be noticed that, during the whole of this process, the attention is kept fixed on the forms of the [88/89] penetrations, that is to say, of the lights as seen from the interior, not of the intermediate stone. All the grace of the window is in the outline of its light; and I have drawn all these traceries as seen from within, in order to show the effect of the light thus treated, at first in far off and separate stars, and then gradually enlarging, approaching, until they come and stand over us, as it were, filling the whole space with their effulgence. And it is in this pause of the star, that we have the great, pure, and perfect form of French Gothic;87 it was at the instant when the rudeness of the intermediate space had been finally conquered, when the light had expanded to its fullest, and yet had not lost its radiant unity, principality, and visible first causing of the whole, that we have the most exquisite feeling and most faultless judgments in the management alike of the tracery and decorations. In many a turn and traverse, as it glides. And oft above, and oft below appears — . * * * * to him who journeys up, . And at that point, and that instant, reaching the place that was nearest heaven, the builders looked back, for the last time, to the way by which they had come, and the scenes through which their early course had passed. They turned away from them and their morning light, and descended towards a new horizon, for a time in the warmth of western sun, but plunging with every forward step into more cold and melancholy shade. 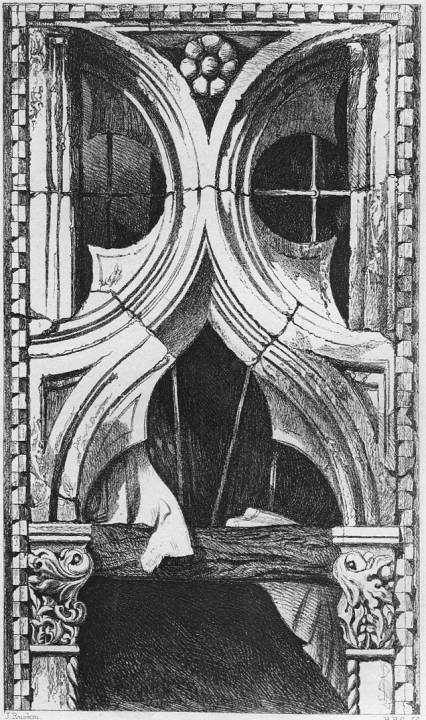 We have seen the mode in which the openings or penetration of the window expanded, until what were, at first, awkward forms of intermediate stone, became delicate lines of tracery; and I have been careful in pointing out the peculiar attention bestowed on the proportion and decoration of the mouldings of the window at Rouen, in Plate X. [at right], as compared with earlier mouldings, because that beauty and care are singularly significant. They mark that the traceries had caught the eye of the architect. Up to that time, up to [90/91] the very last instant in which the reduction and thinning of the intervening stone was consummated, his eye had been on the openings only, on the stars of light. He did not care about the stone; a rude border of moulding was all he needed, it was the penetrating shape which he was watching. But when that shape had received its last possible expansion, and when the stone-work became an arrangement of graceful and parallel lines, that arrangement, like some form in a picture, unseen and accidentally developed, struck suddenly, inevitably, on the sight. It had literally not been seen before. It flashed out in an instant, as an independent form. It became a feature of the work. The architect took it under his care, thought over it, and distributed its members as we see. Now, the great pause was at the moment when the space and the dividing stone-work were both equally considered. It did not last fifty years. The forms of the tracery were seized with a childish delight in the novel source of beauty; and the intervening space was cast aside, as an element of decoration, for ever. I have confined myself, in following this change, to the window, as the feature in which it is clearest. But the transition is the same in every member of architecture; and its importance can hardly be understood, unless we take the pains to trace it in the universality, of which illustrations, irrelevant to our present purpose, will be found in the third Chapter. I pursue here the question of truth, relating to the treatment of the mouldings. At the close of the period of pause, the first sign of serious [91/92] change was like a low breeze, passing through the emaciated tracery, and making it tremble. It began to undulate like the threads of a cobweb lifted by the wind. It lost its essence as a structure of stone. Reduced to the slenderness of threads, it began to be considered as possessing also their flexibility. The architect was pleased with this his new fancy, and set himself to carry it out; and in a little time, the bars of tracery were caused to appear to the eye as if they had been woven together like a net.93 This was a change which sacrificed a great principle of truth; it sacrificed the expression of the qualities of the material; and, however delightful its results in their first developments, it was ultimately ruinous. §. 25. But the declining and morbid taste of the later architects was not satisfied with thus much deception. They were delighted with the subtle charm they had created, and thought only of increasing its power. The next step was to consider and represent the tracery, as not only ductile, but penetrable; and when two mouldings met each other, to manage their intersection, so that one should appear to pass through the other, retaining its independence; or when two ran parallel to each other, to represent the one as partly contained within the other, and partly apparent above it. This form of falsity was that which crushed the art. The flexible traceries were often beautiful, though they were ignoble; but the penetrated traceries, rendered, as they finally were, merely the means of exhibiting the dexterity of the stone-cutter, annihilated both the beauty and dignity of the Gothic types. A system so momentous in its consequences deserves some detailed examination. 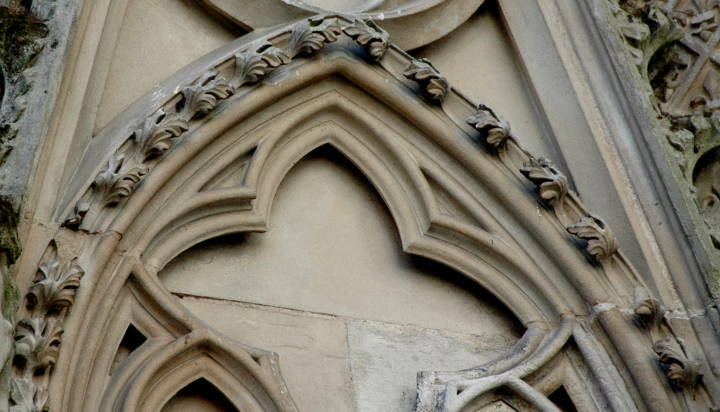 mouldings of the Gable and Vertical, in the window of the Spire of Salisbury. §. 26. 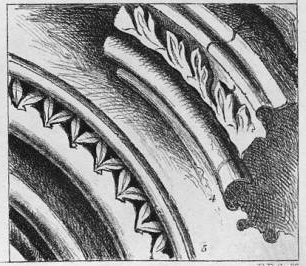 In the drawing of the shafts of the door at Lisieux, under the spandrel, in Plate VII., the reader will see the mode of managing the intersection of similar mouldings, which was universal in the great periods. 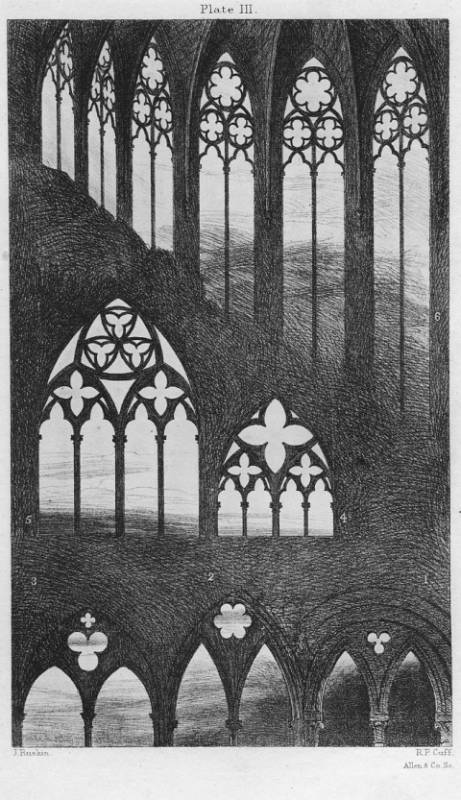 They melted into each other, and became one at the point of crossing, or of contact; and even the suggestion of so sharp intersection as this of Lisieux is usually avoided, (this design being, of course, only a pointed form of the earlier Norman arcade, in which the arches are interlaced, and lie each over the preceding, and under the following one, as in Anselm's tower at Canterbury,) since, in the plurality of designs, when mouldings meet each other, they coincide through some considerable portion of their curves, meeting by contact, rather than by intersection; and at the point of coincidence the section of each separate moulding becomes common to the two thus melted into each other. Thus, in the junction of the circles of the window of [93/94] the Palazzo Foscari, Plate VIII., given accurately in fig. 8, Plate IV., the section across the line s, is exactly the same as that across any break of the separated moulding above, as s. It sometimes, however, happens, that two different mouldings meet each other. This was seldom permitted in the great periods, and, when it took place, was most awkwardly managed. Fig. 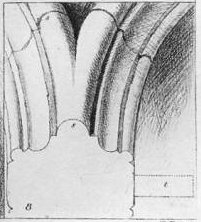 1, Plate IV., gives the junction of the mouldings of the gable and vertical, in the window of the spire of Salisbury. That of the gable is composed of a single, and that of the vertical, of a double cavetto,96 decorated with ball flowers; and the larger single moulding swallows up one of the double ones, and pushes forward among the smaller balls with the most blundering and clumsy simplicity. In comparing the sections it is to be observed that, in the upper one, the line a b represents an actual vertical in the plane of the window; while, in the lower one, the line e d represents the horizontal, in the plane of the window, indicated by the perspective line d e.
§. 28. There was, however, in this kind of involution, much to be admired as well as reprehended; the proportions of quantities were always as beautiful as they were intricate; and, though the lines of intersection were harsh, they were exquisitely opposed to the flower-work of the interposing mouldings. But the fancy did not stop here; it rose from the bases into the arches; and there, not finding room enough for its exhibition, it withdrew the capitals from the heads even of cylindrical shafts, (we cannot but admire, while we regret, the boldness of the men who could defy the authority and custom of all the nations of the earth [96/97] for a space of some three thousand years,) in order that the arch mouldings might appear to emerge from the pillar, as at its base they had been lost in it, and not to terminate on the abacus of the capital; then they ran the mouldings across and through each other, at the point of the arch; and finally, not finding their natural directions enough to furnish as many occasions of intersection as they wished, bent them hither and thither, and cut off their ends short, when they had passed the point of intersection. Fig. 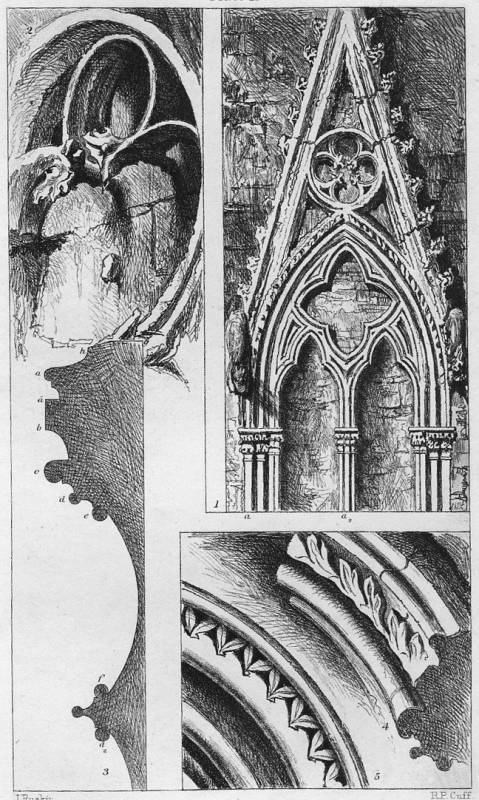 2, Plate IV., is part of a flying buttress from the apse of St. Gervais at Falaise, in which the moulding whose section is rudely given above at f (taken vertically through the point /f ,) is carried thrice through itself, in the cross-bar and two arches; and the flat fillet is cut off sharp at the end of the cross-bar, for the mere pleasure of the truncation. Fig. 3 is half of the head of a door in the Stadthaus of Sursee,100 in which the shaded part of the section of the joint, gg, is that of the arch moulding, which is three times reduplicated, and six times intersected by itself, the ends being cut off when they became unmanageable. This style is, indeed, earlier exaggerated in Switzerland and Germany,101 owing to the imitation in stone of the dovetailing of wood, particularly of the intersecting of beams at the angles of châlets;102 but it only furnishes the more plain instance of the danger of the fallacious system which, from the beginning, repressed the German, and, in the end, ruined the French, Gothic. It would be too painful a task to follow further the caricatures of form and eccentricities of treatment, which grew out of this single abuse the flattened arch, the shrunken pillar, the lifeless ornament, the liny moulding, the distorted and extravagant foliation, until the time came when, over these wrecks and remnants, deprived [97/98] of all unity and principle, rose the foul torrent of the Renaissance, and swept them all away. So fell the great dynasty of mediæval architecture.103* It was because it had lost its own strength, and disobeyed its own laws because its order, and consistency, and organisation, had been broken through that it could oppose no resistance to the rush of overwhelming innovation. And this, observe, all because it had sacrificed a single truth. From that one surrender of its integrity, from that one endeavour to assume the semblance of what it was not, arose the multitudinous forms of disease and decrepitude, which rotted away the pillars of its supremacy. It was not because its time was come;104 it was not because it was scorned by the classical Romanist, or dreaded by the faithful Protestant. That scorn and that fear it might have survived, and lived; it would have stood forth in stern comparison with the enervated sensuality of the Renaissance; it would have risen in renewed and purified honour, and with a new soul, from the ashes into which it sank, giving up its glory, as it had received it, for the honour of God but its own truth was gone, and it sank for ever. There was no wisdom nor strength left in it, to raise it from the dust; and the error of zeal, and the softness of luxury, smote it down and dissolved it away.105 It is good for us to remember this, as we tread upon the bare ground of its foundations, and stumble over its scattered stones. Those rent skeletons of pierced wall, through which our sea-winds moan and murmur, strewing them joint by joint, and bone by bone, along the bleak promontories on which the Pharos lights came [98/99] once from houses of prayer106 those grey arches and quiet aisles under which the sheep of our valleys feed and rest on the turf that has buried their altars those shapeless heaps, that are not of the Earth, which lift our fields into strange and sudden banks of flowers, and stay our mountain streams with stones that are not their own, have other thoughts to ask from us than those of mourning for the rage that despoiled, or the fear that forsook them. It was not the robber, not the fanatic, not the blasphemer, who sealed the destruction that they had wrought; the war, the wrath, the terror, might have worked their worst, and the strong walls would have risen, and the slight pillars would have started again, from under the hand of the destroyer. But they could not rise out of the ruins of their own violated truth.